The suspect arrested by police in Anambra State. 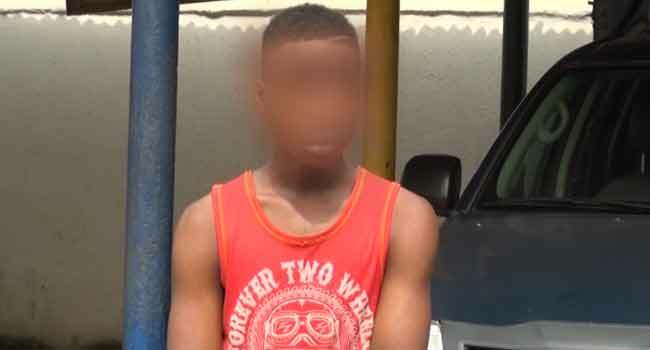 Police have arrested a teenager for allegedly stealing underwear owned by his neighbour in Anambra State. The male suspect was paraded on Friday at the Police Command Headquarters in Awka, the state capital. Police Public Relations Officer in Anambra, Mr Haruna Mohammed, informed reporters that the suspect was arrested on Friday last week by police detectives attached to the Central Police station, Onitsha. He said the suspect stole the underwear spread on a rope at a house located on Umunna Street in Onitsha for alleged ritual purposes. Mr Mohammed urged the residents of the state to be vigilant at all times and promptly report any unusual person or activity in their environment to the security agencies. The teenager, who hails from Ogbaku in Mbaitoli Local Government Area of Imo State, narrated what happened to reporters. He said he was on his way home from school before he was accosted by three boys who asked him to fetch them female underwear and have his life changed for the better. “They told me there is something they want me to do and if I do it, they would give me N80,000. I asked them what to do and they said if I’m able to bring a pant, they will give me N80,000,” the suspect recounted. He, however, said the event did not go well for him as he was caught by a neighbour in an attempted stealing one from his compound.